The clip-clop of my heels bounced obnoxiously between every surface. My white silk blouse was freshly ironed, my hair pulled back to reveal a rarely made-up face staring back at me from the mirrored wall. I made an effort to stand a little straighter. My professional voice was switched to ‘on’. As the elevator climbed to level 55, my heart pounded in my ears and an excited tingle claimed my chest. The doors peeled back to reveal the silhouette of a man standing just beyond reach. For all I knew he was stroking a Canadian hairless cat. But this was no job interview. My eyes adjusted to the background glare. “Welcome to Vue de Monde,” smiled the man, “the rest of your party is already here.” And with that, we were led to The Lui Bar. 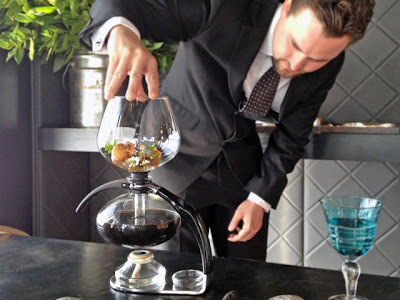 Before I reminisce about one of the most extraordinary dining experiences in the world, it’s worth telling the story of how I came to be sipping a Sous Vide Shrub cocktail, a drink made from slow cooked seasonal fruits that tasted mostly of puréed blood orange, in Australia’s finest restaurant. 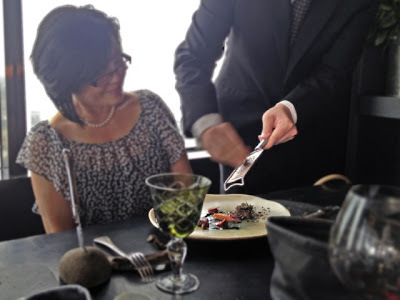 My boyfriend’s parents were celebrating 34 years together, a milestone they chose to celebrate by spending a gift voucher they'd received to Vue de Monde. 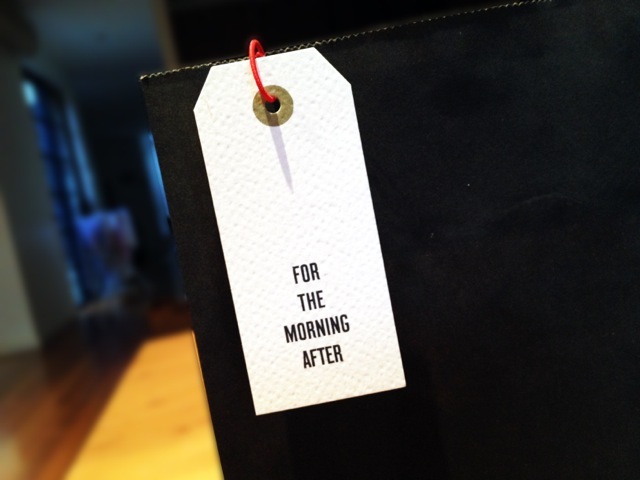 On the morning of their lunch booking, a crippling spell of vertigo left one of them bed ridden. A phone call was made. A booking was cancelled. A $300 cancellation fee was charged. 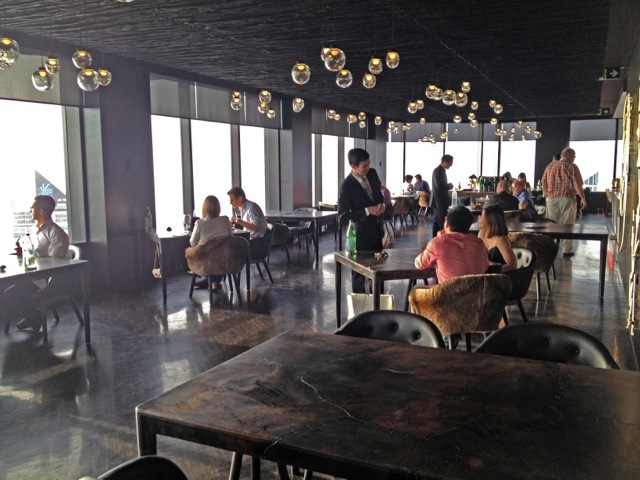 The $150pp cancellation fee at Vue de Monde has been a topic of controversy before, but after considering the circumstances—and after as many phone calls as there were courses— Vue de Monde decided to waive the fee. As a token of their appreciation, my boyfriend’s parents decided to bring the kids. Everybody won, but I felt especially victorious. Sitting at The Lui Bar, peering down at Melbourne with a hint of godliness, you could almost say it was meant to be. The cocktail menu resembled a pop-up book, each page with a colourful, cartoonish image accompanied by a story about the drink. The history of the Negroni, a bitter beauty of Bombay Sapphire gin, Carpano Antica Formula and Campari was dressed with an orange twist and served with a side of almonds, crystallised in Campari and orange sugar. 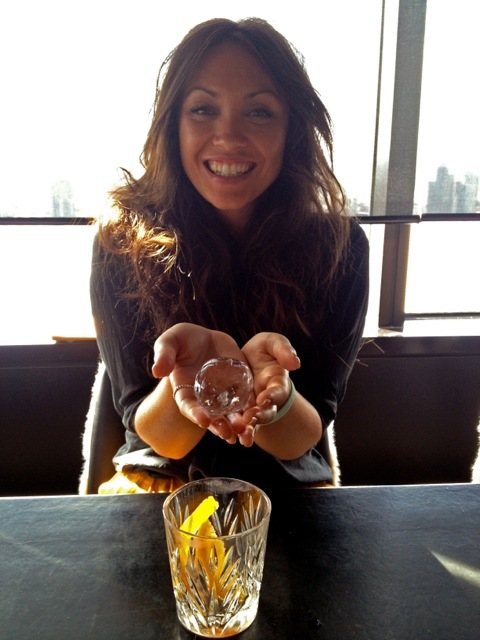 The perfectly rounded globe of ice was most entertaining. I instantly forgot my manners and poked it. And no, it wasn’t my drink. Cocktail envy ensued as soon as I sipped the Velvet Rotor Macadamia Martini. 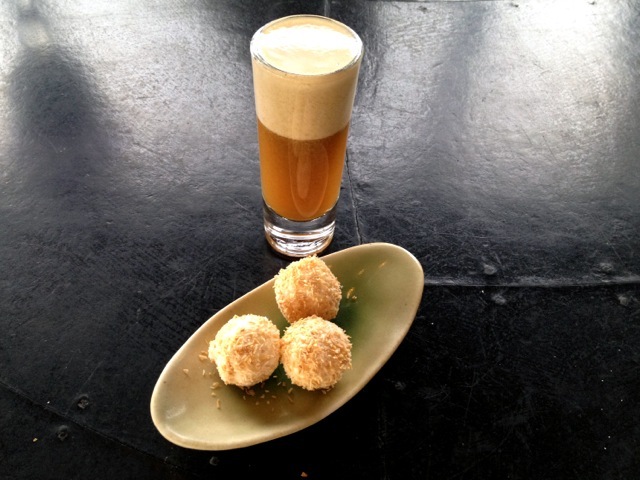 Fresh Australian macadamia nuts are heated and then fat washed, where a fat (the nut) is melted with a spirit (Belvedere Vodka) and then chilled so the fat separates and can be strained. Next comes the Rotary Vacuum Evaporator, which renders the liquid clear. 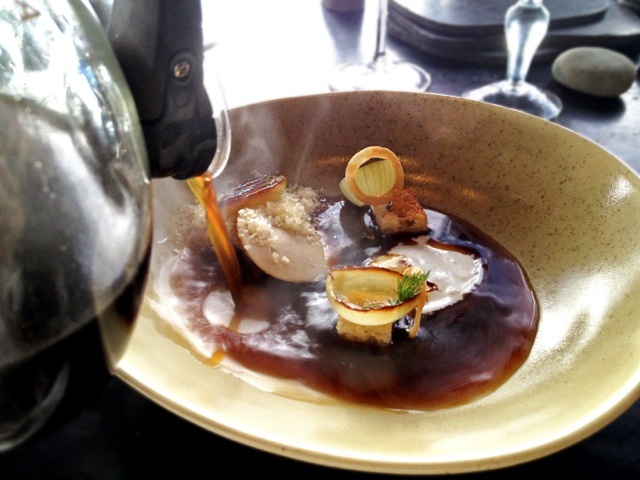 Finally, sugar cane reduction, vermouth and vaporised butter are added. It sounds like a lot of work, but the lingering aftertaste of sweet velvet was worth the effort; the smashed macadamia praline on the side, a sticky stairway to heaven. After we had polished off our cocktails, we were led from The Lui Bar—with its modern gold and black chesterfield couches, bouquets of glass spheres posing as lights, slate grey stone bar and cellophane-esque ceiling—past the barman hand-sawing a mammoth slab of ice, through the contemporary wine cellar, and into the restaurant. Our eyes darted to a wooden trolley of cheese: wedges speckled with rich blue mould and half wheels so oozy they struggled to hold their form. White LED lights that barely resembled trees stood out against the black walls, gazing across the room at the floor to ceiling windows. Everything was black. 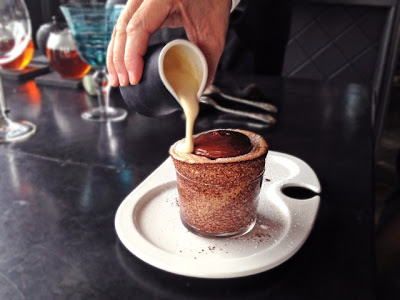 Black leather tables, black chairs adorned in kangaroo skins, black ventilated ceilings; even black break baskets filled with fennel spiked sourdough and smooth, hot stones. Everything was black, except for the kitchen, a white marble stage rimmed in a pinkish-red LED light that highlighted the culinary theatre. Not a moment after we were seated, thin slithers of brittle, hand-cut salt and vinegar chips whet our appetites, accompanied by a rich macadamia and apple dip. We ordered a bottle of 2009 Craggy Range Pinot Noir from Central Otago New Zealand, a smooth drop that reminded me of picking wild blackberries in the south of France. 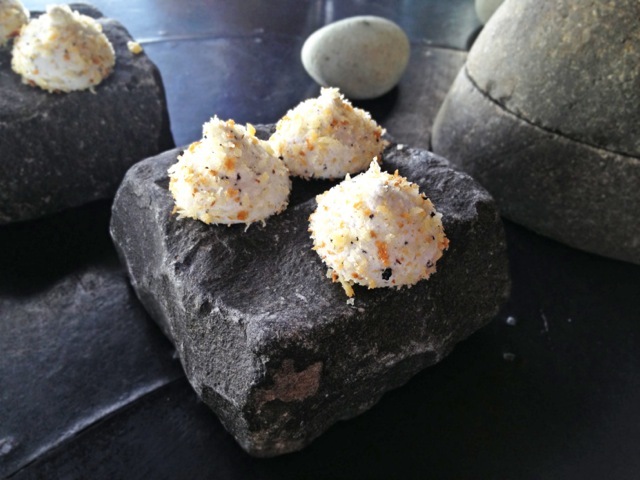 Fluffy drops of truffle marshmallow rolled in a fine crumble were served on rocks alongside squares of sweet smoked eel coated in a white chocolate shell and finished with caviar. 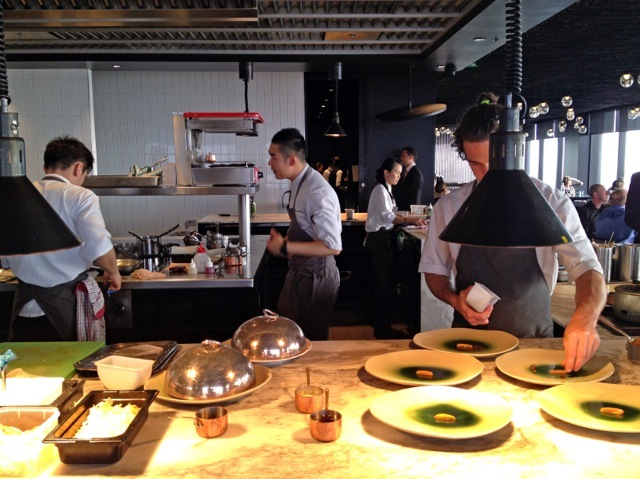 Three dishes in, Vue de Monde’s Assistant Manager, Chris Martin, assured us that we hadn’t started lunch yet. After a few hours in Chris' hands, he made his Coldplay counterpart of the same name seem comparatively dull. 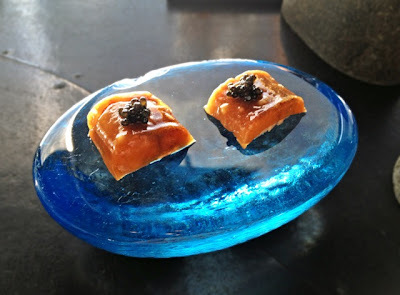 A pool of clear tomato jelly arrived next, decorated with dried strawberry 'raisins’ and purple and orange flower petals. 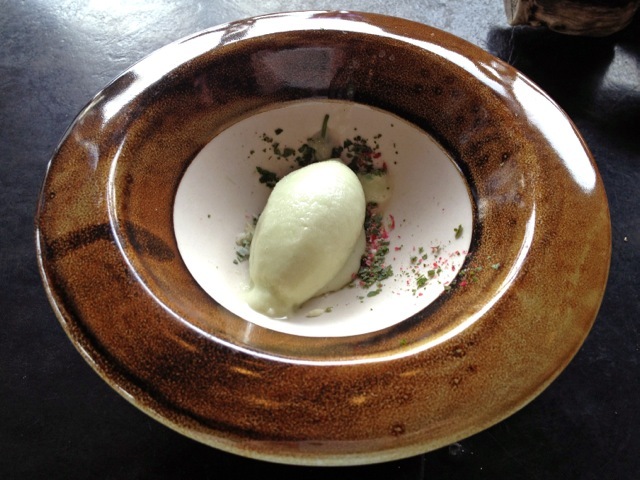 A spoonful of salad snow, an icy green substance made from lettuce and dry ice, completed the cleanser. Ribbons of salt-cured wallaby loin cooked at 65 degrees Celsius were served on a Himalayan rock salt block and dissolved at the back of the mouth in meaty ecstasy; while pretty vegetable rolls made from thinly sliced vegies were perfectly aligned and crowned with a tiny purple flower. Next, Chris brought a coffee siphon to the head of the table, the bottom half filled with Melbourne onion soup and the top with camomile, St. Peter’s wort and beach mustard. Heat from a blowtorch forced the liquid to cascade from the top and infuse with the herbs. The concoction was poured into a bowl arranged with onion cooked various ways (were they fried to a crisp, pickled, poached and candied? 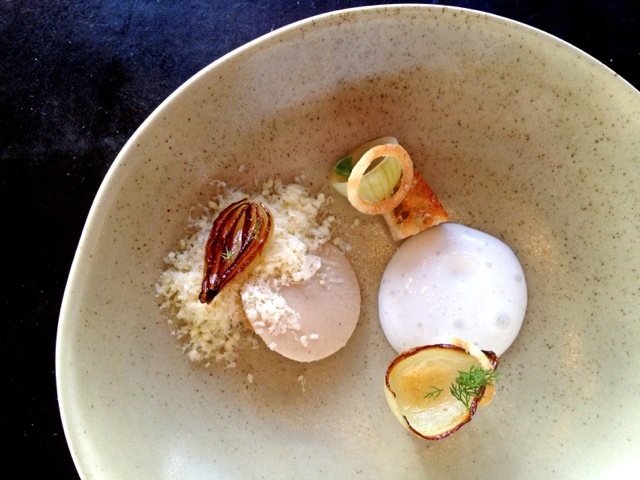 ), finely grated Gruyere, cheesy foam and a disc of macadamia and onion gel set with agar. The flavours were rich and warm; I couldn’t help but hold each spoonful in my mouth until it slid down my throat naturally, like liquid gold. “You look like a turtle,” observed the boyfriend. 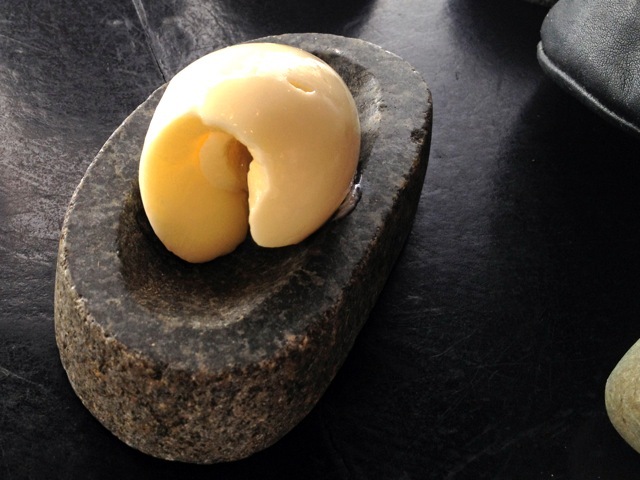 The award-winning butter alone deserves a mention, if not a devoted cult following. 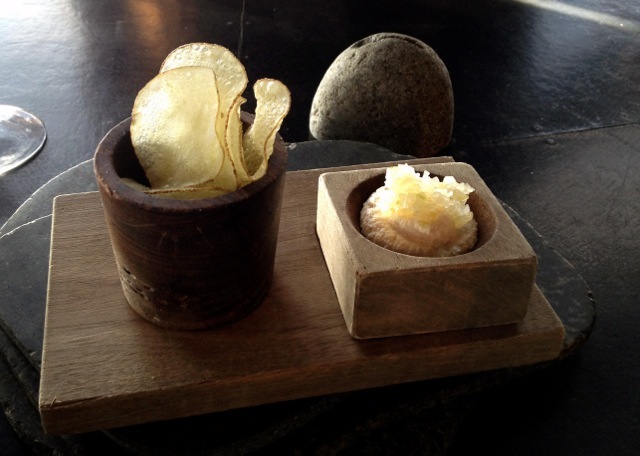 A giant wooden basket of Échiré butter from western France was wheeled to our table. A heated silver spoon and a flick of the wrist saw two glossy quenelles placed on stones in front of us. Échiré is the epitome of exquisite excess, and we all suffocated our bread with generous helpings. A sneaky knife-full to the mouth—hold the bread—revealed the full creaminess of this delicate, artisan spread, packed with nearly 85% butterfat. Unfortunately, you can’t buy Échiré from Vue de Monde, even though you’ll have no trouble finding it in an English supermarket. When we ran out of butter, our dishes were refilled. But by this stage we had something else for our bread to mop: a duck yolk poached at 58 degrees Celsius. 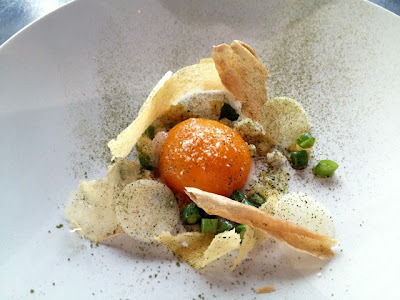 The yolk was the consistency of mayonnaise, served with salty curls of dried pork, crisp wafers of sourdough, circles of sautéed pear, chopped green peas and clusters of smoked egg white. The ingredients were bound with a dusting of salad powder, and each plate was mopped until it was nearly as clean as the expansive windows. A just-cooked marron tail dipped in a luscious brown butter anchored with tarragon was so plump and fresh I wanted it to live on my tongue for eternity. Beside it, a sprinkling of marron powder made from the crustacean’s shell, along with a delicate ‘marron sandwich’ with a creamy finish. Another palate cleanser, another performance. 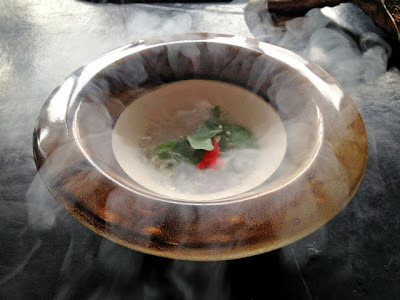 Liquid nitrogen was poured into a bowl of sage leaves, cucumber and flower petals. 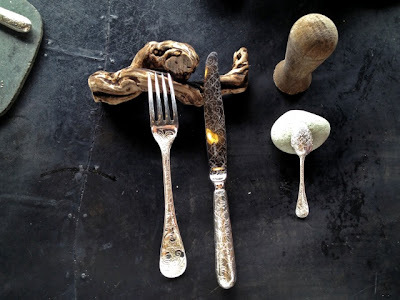 We were instructed to take the wooden pestle that had been placed next to the detailed silver cutlery (resting on the gnarled branches of aged Grange vines, no less) and crush the ingredients together. Once the dry ice had settled, a refreshing cucumber and pineapple sorbet completed the cleanser. It was time for mains. 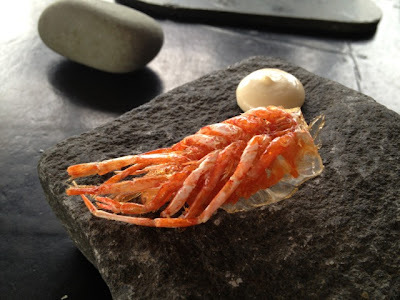 A voluptuous banana prawn perched so straightly on the plate you would think it had been electrocuted. 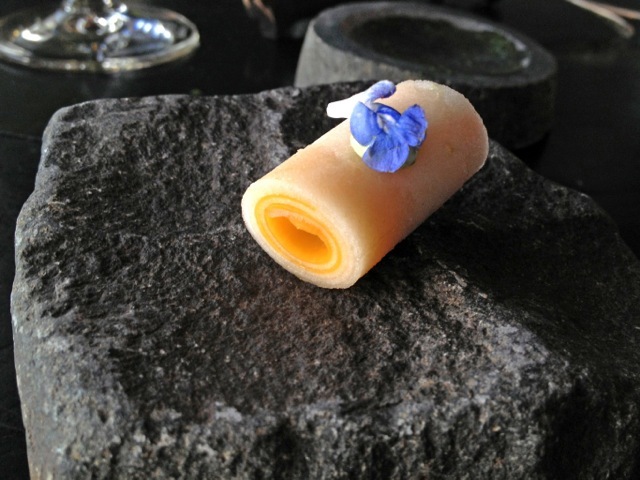 It leaned against a ribbon of potato, rolled into a tube and topped with micro herbs. Firm, succulent barramundi completed this taste of garden and ocean, bound by swirls of nettle purée and young garlic. 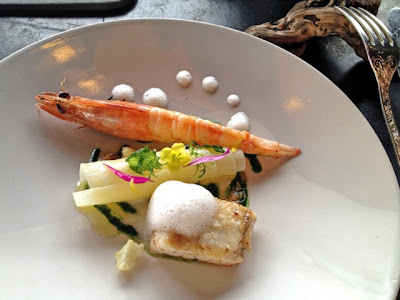 Chris smothered the fish in barramundi foam, and then dotted the edges of the plate with it, too. 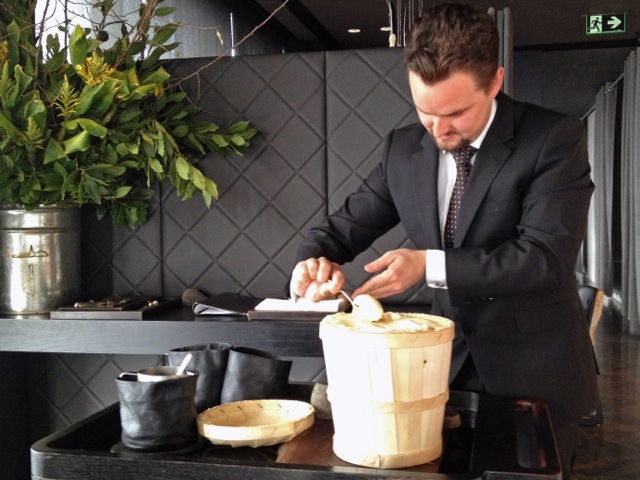 “Cory hates it when I do this,” Chris said, referring to Vue de Monde Head Chef Cory Campbell, “but I’m going to do it anyway! You’re not going to put this on the Internet, are you? I’ll get in trouble!” Sorry Chris, I couldn’t resist. A cheeky ‘prawn cracker’ side dish accompanied the above, a fried-until-crisp prawn head that crackled then melted as you bit into it. The things I would do to have a whole bag of Vue de Monde prawn crackers every time I sat down to watch Game of Thrones. 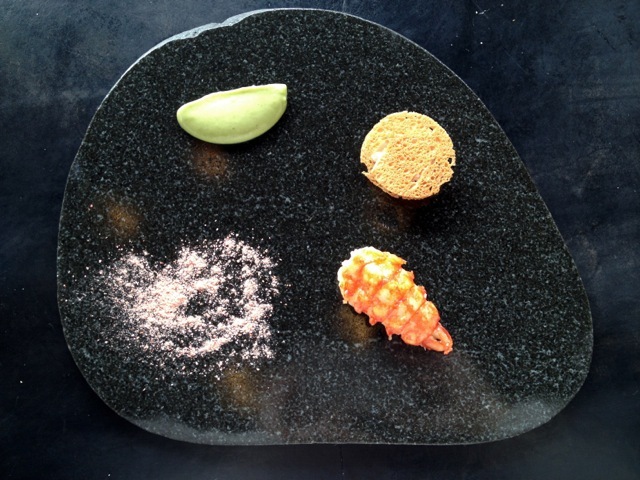 The final savoury course did not disappoint. 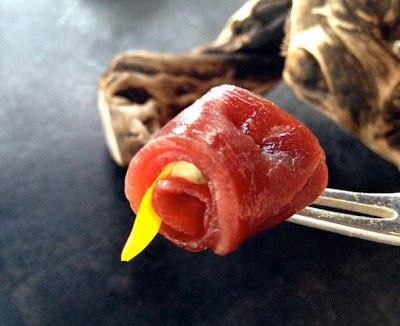 A cube of wagyu cheek was so luxuriously tender I simply can’t remove the ‘melt-in-the-mouth’ cliché from my mind. Its softness was balanced by crisp saltbush leaves with the nostalgic aftertaste of sunbaking on a private strip of Ninety Mile Beach in Gippsland. Another taste of the animal, this time tenderloin, was riddled with marbling. 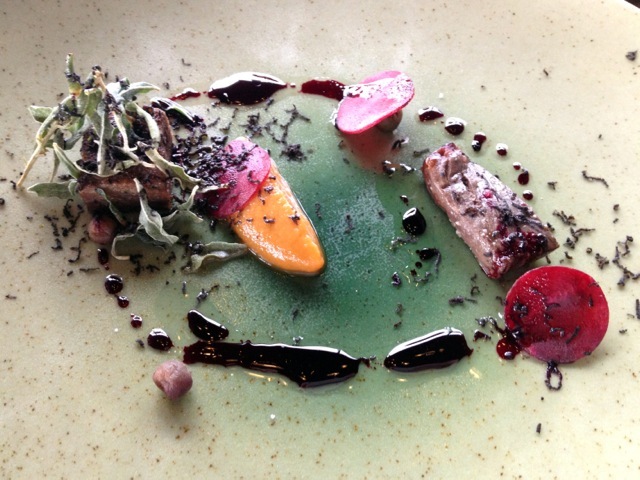 A zesty beetroot purée cut through the fattiness. Any informality from the homemade BBQ sauced was extinguished by generous shavings of black truffle. Non-alcoholic, passionfruit ‘beer’ was subtly flavoured with liquorice and served with icy balls of coconut ice cream that paved the way for dessert. A portrait of pretty, described inadequately as ‘strawberries and cream’, extracted guttural hums of pleasure from the table. The assortment of milk ice cream, a strawberry meringue disk and fruity gels, jellies and compotes looked like a collection of treasures saved by a little girl. 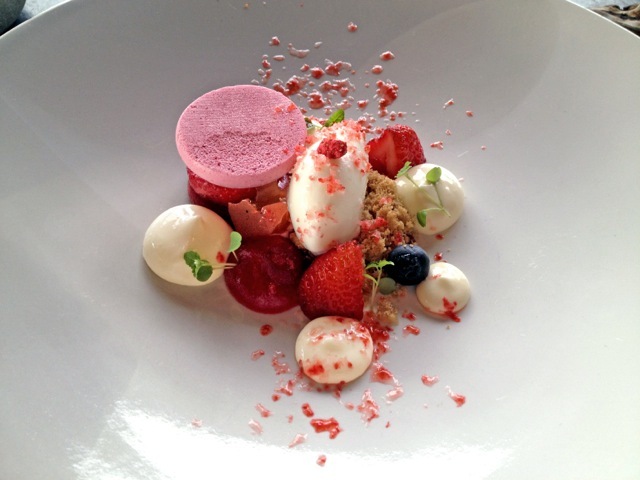 Finished with a grated, snap-frozen strawberry, our mouths, nostrils and minds were filled with summer. 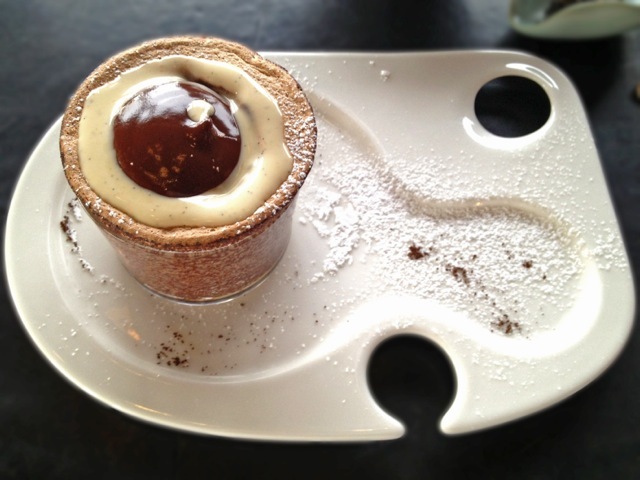 It was a good thing the strawberries and cream dessert was light, because a lavish chocolate soufflé filled with a chocolate mousse and crème anglaise left us floating on cocoa clouds, 55 storeys above Melbourne. 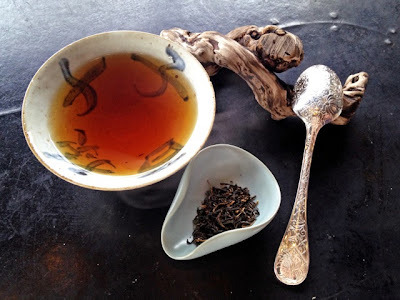 Vue de Monde’s tea sommelier (yes, that’s a thing) paired our final dessert with Golden Monkey tea, a black variety from China traditionally reserved for the royal. 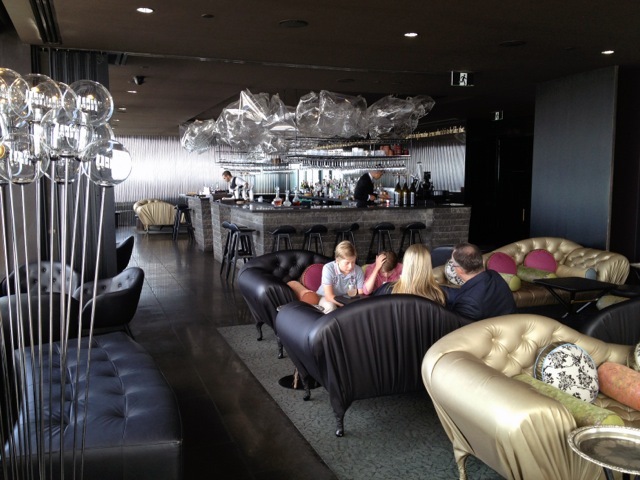 At Vue de Monde, we felt nothing less than kings and queens. 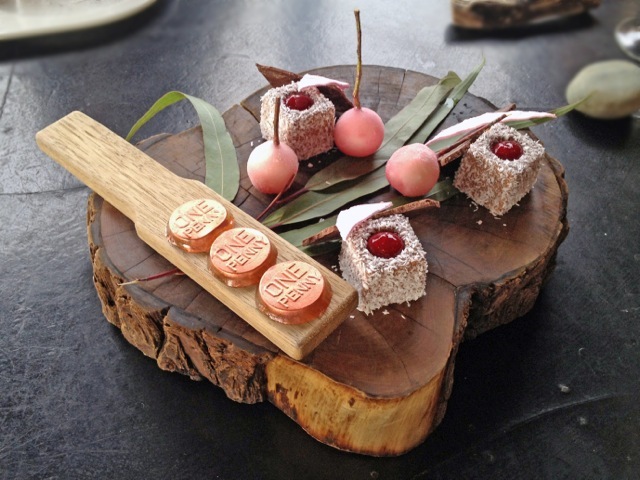 To finish, a segment of gum tree disguised as a platter presented a selection of petit fours: cherry lamingtons with mousse centres, pink musk leaves, invigorating balls of eucalyptus ice cream, dark chocolate shards and gin jellies coated with gold in the shape of one penny coins. Three and a half hours later, our lunch was over. But the food didn't stop there. 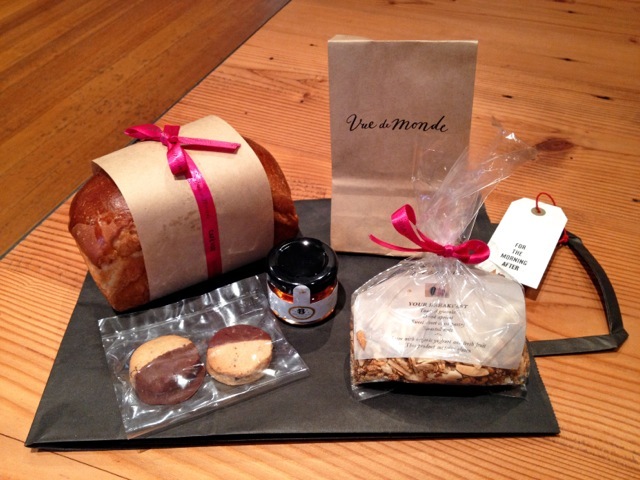 On the way out we received goodie bags 'for the morning after', filled with a mini brioche loaf, a small jar of honey, some muesli, two cookies and a paper bag of tea. 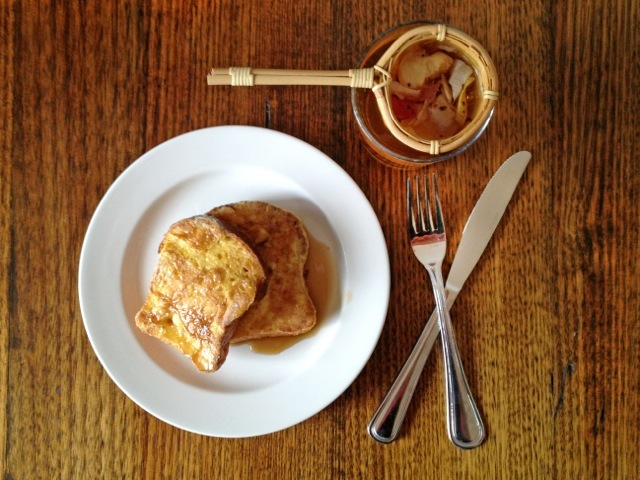 Starting the week with French toast, ingredients supplied by Vue de Monde, was delightful. Monday wasn't so bad after all. Anyone who’s visited Vue de Monde will tell you it’s more than a meal, it’s an experience. But what I love about Vue is that it’s always full of firsts: the first time I’d crushed freeze-dried herbs with a pestle, the first time I’d sipped soup from a coffee siphon, the first time I’d seen Melbourne CBD bathed in a relaxed, Sunday afternoon glow. Vue de Monde is fine dining, redefined. You won’t find white tablecloths or snobby staff, but instead décor that resembles a well-to-do bachelor pad and hosts that balance knowledge with a sense of humour. 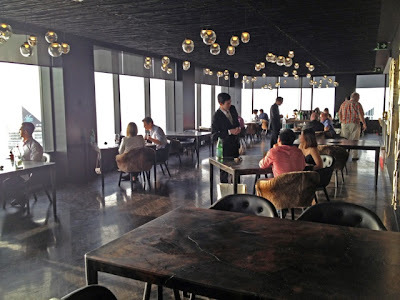 In writing this post, I was trying to think of a single word to describe Vue de Monde. A few fluttered around in my head such as contemporary, experiential and gastronomic, but only one word stuck; Vue de Monde is Melbourne. *A special thank you to Neville and Rebecca John, for sharing their anniversary and appetites with me. It does! 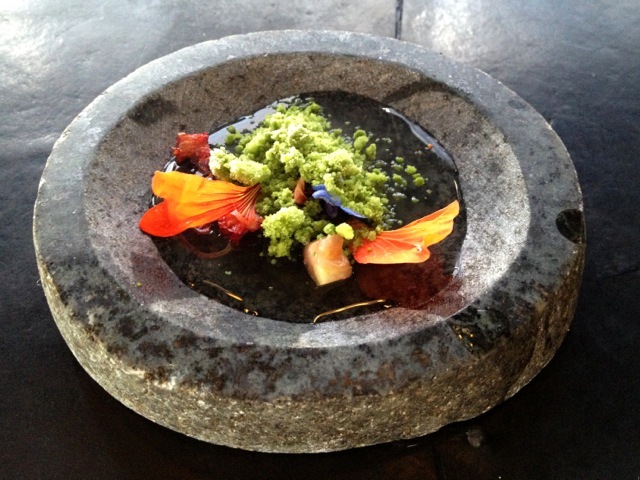 So much work goes into every dish, from production and concept to plating and the eating experience. So proud that it's in Melbourne! Lucky you! What an wonderful experience, and yes, it's so full of 'firsts'!